New Year equals new resolutions, aka - time to (try to) get in shape! With everything we’re juggling in life, we need a way to relax, calm our minds, and refocus our energy, and if we can also burn a few calories while we’re at it, sounds like a win! Yoga is a life-giving, exhilarating way to take care of yourself! I’m not an expert yogi by any means, but I have been to my fair share of yoga classes (on and off) and practice on my own occasionally (okay, like once a month with my dog doing down dog next to me). Why did I start doing yoga? I had a crazy busy, stressful schedule and no time for myself. I needed a way to recharge, and one hour for a class was about all the time I had to spare. Why have I continued to practice yoga? Let me be the first to tell you, it is impossible to leave a yoga class with anything but good vibes. Plus, I’m not your typical exercise gal and have always had an issue sticking to any kind of super intense exercise routine. I find that yoga is both a great exercise, is always switching it up, and really makes me feel zen, so I am all about it! Now I go to a yoga class at my local gym at least once or twice a week and really look forward to that mean time for my mental and physical health! Yoga may seem like just a series of stretches and awkward poses that you have to hold, but it really is so much more than that. It is a mental stretch just as much as it is physical, and it allows you to push past what you thought your limits were. Personally, I love that the positions always stay somewhat consistent so it’s easy to compare my personal growth week to week! Furthermore, during savasana, I’m able to take a few minutes that are completely mine with absolutely no distractions, and it really allows for some quality introspection time. Trying new things and challenging yourself is a brave and beautiful thing! It shows that you care enough about improving yourself to do something hard. (or… it shows that you are willing to do something hard for the possibility of improving yourself.) But if I’m being real, it can still be scary and intimidating. 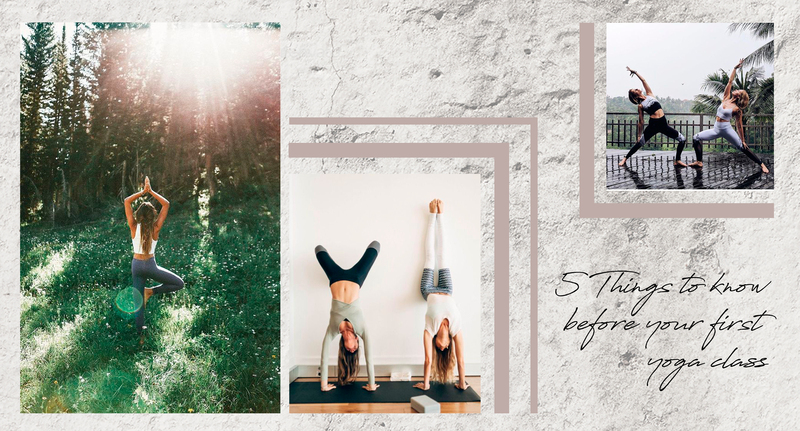 That’s why I collected this list of five helpful things to know before you go to your first yoga class, and let me tell you, I wish I knew these things before my first few classes! I hope this will give you the a little confidence boost to ignite the courage that’s already inside you! Try something new this year babe, I know you will be so happy you did! Know what type of yoga class you signed up for - it is important to know what kind of class you are going to so you can know what to expect and plan accordingly. If you are attending a hot yoga class, you’ll want to eat light and clean throughout the day and stop eating a couple hours before your class. You also want to be fully hydrated, so be sure to sip water steadily throughout the whole day (don’t chug it all right before you go in!). I also recommend a super ice cold water because that class can really get HOT! It’s nice to be able to pour a little on your face if the heat gets a little overwhelming. If you’re attending a power yoga or Vinyasa style class, which both focus a little more on strength and are the more difficult classes in my opinion, you will want to include protein in your diet leading up to the class but definitely eat light a couple hours leading up to the class. Knowing the different types of yoga will help you choose one that is best for your fitness level and will allow you to better mentally and physically prepare! And don’t forget, yoga is all about doing things at your own level, so no matter what class you take, push yourself, but so hard that you’re outside your own abilities (trust me, you’ll regret it like I did). What to wear - this will also depend on the type of class you are going to! For a tradition yoga class, we suggest a good pair of leggings (won’t slide down or ride up! 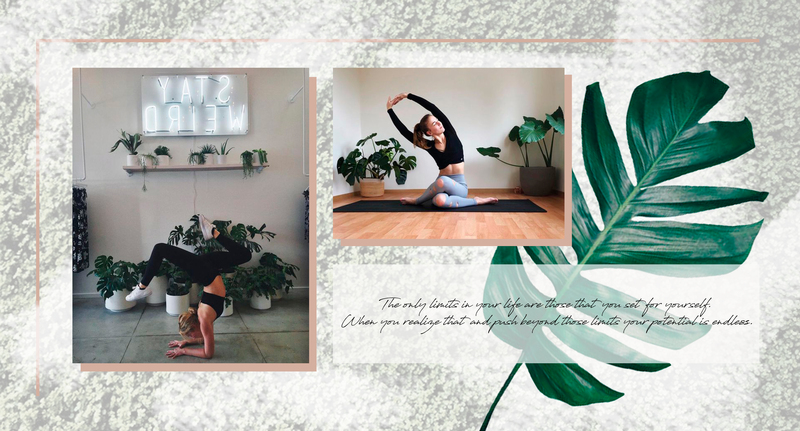 ), a form fitting tank top to allow your arms to move freely, and a sweatshirt or zip up to layer in case you get chilly or for good old savasana. You don’t want to wear a loose or flowy top because it will most likely come down over your face during inversions (downward dog for example). If you are going to a Bikram style class (hot yoga), once you step in the room you will probably want to rip off all of your layers! I usually wear spandex shorts and a sports bra, and I just bring clothes to layer over for when I’m leaving the studio. Remember you’ll be practicing barefoot, so I suggest wearing sandals or easy to take off shoes so you can easily slip them on and off. Ultimately it’s about whatever you feel the most comfortable in! I personally am obsessed with the Joah Brown Second Skin Leggings because they realllyyy stay in place! What to bring - most yoga studios ask you to bring your own mat, and they’ll supply any extra blocks or straps. (If you’re not sure about your studio, you can always call and ask before you head in for class!) If you’re taking a class at a gym, they usually have mats but they’re never super amazing. My personal favorite are the lululemon yoga mats! I’ve had mine for years and it has a nice cushion while also keeping your hands from slipping! Furthermore, make sure you bring plenty of water, a sweatshirt to layer, a hair tie or headband, and a snack for afterwards if you didn’t eat before your class! Avoid comparing yourself to other - this is part of the mental exercise. If you’re new to yoga and your class is filled with more experienced yogis, it can be really easy to compare yourself and get discouraged. But that is not what yoga is about! It’s up to you to decide if that gap between where you are and where you want to be is going to motivate you or discourage you. Remember that everyone is a beginner at some point, and your potential is limitless if you keep trying! So just focus on your own mat, who cares what everyone else is doing. I know this is easier said than done, especially when everyone is doing a vinyasa while you are the only one opting for the child’s pose, trust me, it will really pay off in the long run! Also, everyday is different so never push past your own limits and listen to your body! You’re going to lose your balance, just keep trying - it’s okay if you make mistakes! That’s part of the learning process. If you lose your balance or just can’t hold a pose, it is okay! Just do your best, and if you keep trying you’ll be able to do it in no time. Just focus on keeping your core strong and find a non-moving target to focus on, and I promise you will get the hang of it! The best is when you even surprise yourself with your own improvement! At the same time, don’t be alarmed if the instructor comes up to you and gives you some constructive criticism. They are there to help you grow and improve! Like I said earlier, yoga is a physical and mental exercise, but it is impossible to experience personal victories, big and small, without embracing the challenge! We believe in you, babe! This entry was posted in BitterSweet, Blog, Inspiration, Lifestyle. Bookmark the permalink.